By Andrew Osmond. 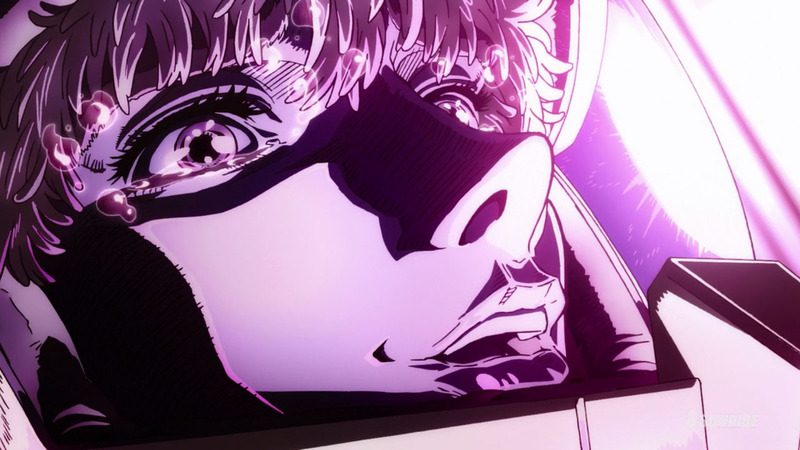 Gundam Thunderbolt: December Sky may be the closest that anime has ever come to producing a full-blown Vietnam film. 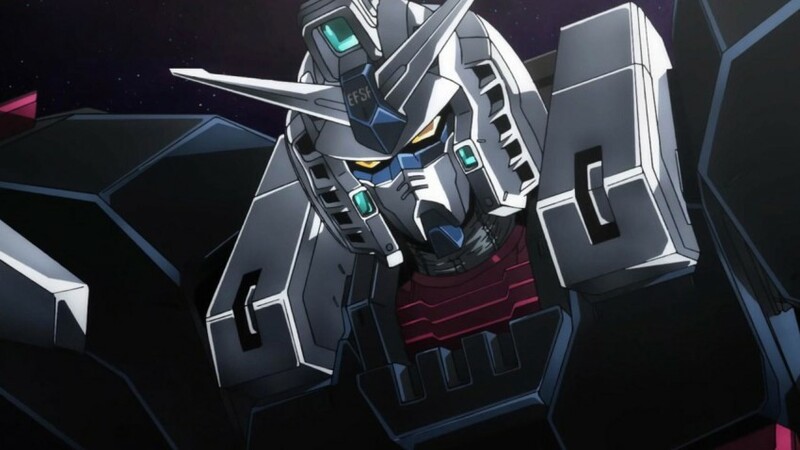 The Gundam franchise has always been about war, but Thunderbolt suggests its makers were marathoning films like Apocalypse Now and Born on the Fourth of July. Thunderbolt makes a “gritty” Hollywood franchise film like Rogue One look like, well, Star Wars. The classic Gundam shows could be downbeat with high body-counts. But they also had elements of gee-whizz SF wonder, like the vast cylindrical space colonies where much of their action took place. Thunderbolt takes place around a space colony, but it’s smashed and dead, a fragmented tombstone for millions, desecrated by mecha rushing through its ruined streets to increase the mega-kill list. Gundam Thunderbolt’s production overlapped with Gundam: The Origin, also available from Anime Limited. Like Thunderbolt, Origin revisits Gundam’s first space war, taking advantage of cutting-edge production values. But Origin was different; it was a reunion party for fans, stuffed with characters from the 1979 series, and tied together by the most famous Gundam character of all, Char Aznable. In contrast, Thunderbolt’s characters are new, and they’ve been through experiences to dwarf Char’s operatic obsessions. The December Sky film takes place entirely in space, in the region round the ruins of Side 4. A space colony aligned with the Earth Federation, Side 4 was wiped out by the Zeons, with unimaginable loss of life. Perhaps because of these man-made cataclysms, the area is subject to lightning discharges – hence the film’s name – so that it resembles a stormy sea on Earth. In Gundam tradition, the action is split very equally between two sides of the conflict. On one, there are the survivors of Side 4, embittered by the destruction they’ve lived through, still embodied in the debris around them. The shattered hulks of skyscrapers, drifting dismembered in space, can’t help recall the end of Akira. Among these survivors is one of the film’s two main characters, Io Fleming. Anime is known for weird name in-jokes – Char himself was named in tribute to a legendary French singer, Charles Aznavour, who died only this week – so we suspect Fleming’s name nods to a certain British spy author. At first sight, Fleming seems to be a space ace from sci-fi pulp, a pilot with a quirk. When flying into battle with his mecha, he immerses himself in music, specifically free jazz. If you’re wondering, his character long predates last year’s film Baby Driver. In the opening minutes, we see Fleming drumming on his cockpit while chatting to his less cool friend in glasses, Cornelius. This might be a nod to a similar pairing in the jazz manga Kids on the Slope, animated by Shinichiro Watanabe and remade last year as a live-action film. But the space ace is soon undercut. Fleming’s father was not a hero, but the ruler of Side 4 who killed himself when his colony was destroyed, and who’s now remembered with contempt by the survivors. As for Fleming himself, he’s addicted to the “rush” of mobile suits, tripping on endorphins while he kills. Fans of Studio Bones’ Eureka Seven may remember Renton’s bad “acid trip” in that show, and its grisly consequences. Fleming has a beautiful girlfriend, but she’s a suicidal junkie, hated by her subordinates. She’s driven over the edge by sights like the Federation sending children to the front line, meat for the grinder. Lorenz himself listens to old pop tunes, and some of the pop interludes in Thunderbolt – such as a masterful sequence where Lorenz jumps around his life in memory – feel very like Vietnam War cinema, till you expect Jimi Hendrix or The Doors to break in. (They don’t.) However, the music device was also present in the original Gundam Thunderbolt manga by Yasuo Ohtagaki, serialised in Japan in Big Comic Superior and available in English from VIZ Media. In the same interview, Ohtakagi stressed his love of the first Gundam series and the film trilogy compiled from it. Indeed, he claimed that the first Gundam is still the greatest mecha anime ever. But rather than the iconic title robot, he highlighted the suits on the Zeon side, the moss-coloured Zaku. “The image of Zaku’s flashing eyes is still with me, and I have not seen a greater design,” he said. Thunderbolt takes the opportunity to create a new kind of Zaku, though it’s not green. The choice of this mecha’s colour – livid red – is perhaps one of the few bits of “service” to old-school Gundam fans. Yet Thunderbolt plays very differently from the first Gundam. When I interviewed franchise father Yoshiyuki Tomino about the original, he mentioned that he was inspired by the chivalrous ideals that lingered in parts of warfare until World War I – for example, in early aerial combat. In the 1979 series, Char and his Federation foe Amuro Ray develop a degree of respect for each other. Thunderbolt, though, highlights how much Fleming and Lorenz loathe each other – for instance, Fleming cruelly taunts Lorenz for his disabilities. 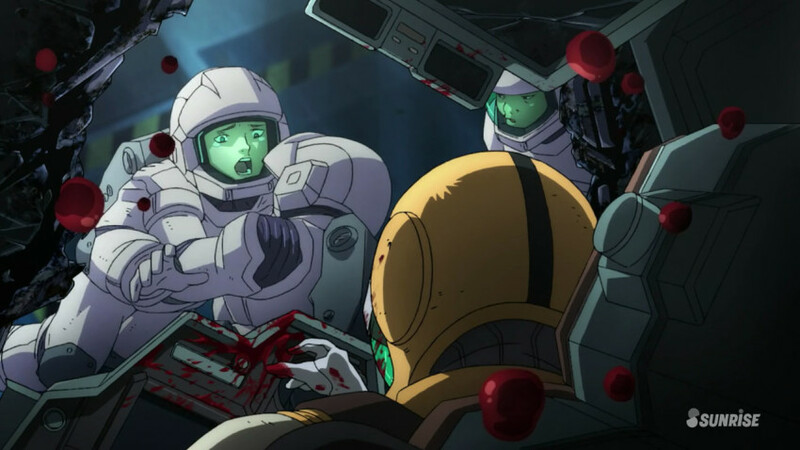 Later in the film, there’s a chilling moment when the Zeon cry “Sieg!” is used by a group of suicide bombers. It’s as if Thunderbolt is ramming the World Wars of the last century forward in time, into the nightmares of today. One might object that Thunderbolt still offers the pleasures of spectacle, only heightened by the anime medium and the big screen. The same issue arose with Apocalypse Now, with its napalm balloon-clouds and Wagner-blasting helicopters. Like other high-grade mecha anime, Thunderbolt offers dazzling zig-zag battles, mapped by luminous lines of robot suit exhaust. The killer beams and explosions are as beautiful as ever. The random flashes of space lightning, which interfere with the conflicts like capricious dei ex machina, add an extra visual garnish. But like Coppola’s film, Thunderbolt smashes all sense of war as an adventure, a heroic endeavour. If the film has a signature detail, it may be a glimpse of a character on a stricken battleship, offering to help get a wounded man into an escape pod. Then he knocks the stretcher away and dives into the pod himself. Gundam Thunderbolt: December Sky is screening at Scotland Loves Anime and is being released on UK Blu-ray by Anime Ltd.